Summertime Tri-Tip on the Weber BBQ - One of my all-time favorites. Tri-tip is perfect for BBQ'ing over charcoal on the Weber. Very tasty - and a cinch to cook. If you have any left overs (doubt you will! ), tri-tip is perfect over salad the next day - see: Scott's Lazy Sunday Tri-Tip Caesar Salad. Easy Tri-Tip Roast on the Gas Grill - Got a gas grill? Here's an alternative to charcoal grilling those tri-tips! If you have it handy, be sure to try seasoning them with Montreal steak seasoning - adds just the right amount of flavor and zip! Scott's Perfect Charcoal BBQ Thick Cut Pork Chops - These charcoal grilled thick pork chops are a perfect match to some sauerkraut with bacon and BBQ sauce! I love the Galena Street rub from Penzey's - it's perfect for these chops. Yum! For a great side dish to go with the tri-tip, try my recipe for Scott's Easy Baked Onions - or the Melted Onions actually cooked in the charcoal coals of the BBQ. Fire up that grill - and have a great holiday weekend! What's for Christmas Dinner? Pork Loin w/Apples! We're trying dry brining the pork loin for a few hours in advance of cooking. The advocates of dry brining suggest that a day or so is the ideal timing for it - but I didn't decide to try it until just a few hours before we need to serve dinner! So, it will be an abbreviated version. To do the dry brining, I covered the pork loin (a 3.3 lb roast this year) with salt and put it into the refrigerator uncovered. When it's time to cook, I'll rinse the salt off the roast and then season it with salt, pepper and Penzey's Bavarian Seasoning. From there, it's back to our original recipe! This pork loin roast turned out REALLY GREAT! Even though the dry brining was abbreviated, the roast came out great - moist, not dry at all - and a perfect compliment to the apple/cream/mustard topping. To add a bit more complexity to the topping, I also included a couple of rosemary springs and a layer of sliced red onion. This combination added beautiful flavor and complexity to the topping. We've cooked this recipe many times over the years - although not much if ever during 2012. Today's treatment makes us want to come back to it again soon. Try it for your family - it's a huge favorite with ours! Tonight, we're making a pork loin roast using this old recipe from Scott's Kitchen. This was one of our regular favorites back in the day - but it's been a few years since we've made it. The feel of fall in the air today tempted us to upgrade to this pork loin roast from a quick pork tenderloin recipe we were considering for tonight's dinner. I made one addition to tonight's recipe - adding a hearty coating Penzey's Bavarian Seasoning and a bit of lime juice as a rub before searing the roast in the French Oven. Sure smelled wonderful when I seared it just a few minutes ago! Here's the pork loin as it's coming out of the oven after 55 minutes total time. After taking the roast out of the oven and wrapping it in aluminum foil, it's time to remove the apples and then deglaze the French Oven with a bit of wine. After deglazing, simply put the apples back into the pot, add in the cream and the mustard and you've got the perfect sweet/tart side dish to compliment the pork. This is a wonderful combination - love those Granny Smith apples! Perhaps add a green salad like we did tonight and you're done. A great hearty weekend meal! Yesterday, I picked up some boneless pork chops from Trader Joe's - each about 3/4 of an inch thick. These chops are perfect for a quick (25 minutes or so) meals when cooked in a skilled on the stove. They're also low fat! This technique involves first searing the pork chops on high heat for 2 minutes/side to get a nice flavor on the outside - and then slowing down the cooking with some liquid that helps keep them moist and flavorful on the inside. The mustard and lemon juice used for the finishing sauce adds a very nice sweet/sour taste to the chops - they're delicious. Here's my recipe - modified from Mark Bittman's recipe. An hour or two before I cook the the chops - or at the last minute if I forgot (! ), I first coat them liberally on both sides with my favorite pork seasoning rub - Penzey's Galena Street. This rub is an absolute must have for grilling thick pork chops on the Weber BBQ - and its equally good for these pan-fried chops. Trust me, Penzey's Galena Street Rub is just the best for pork chops! Heat 2 Tbsp of olive oil on medium-high heat in the skillet until it's shimmering. Add the chops to the skillet and turn the heat up to high. Cook on high for 2 minutes per side. Add 1/2 cup white wine, 1 Tbsp minced garlic and 1 Tbsp minced shallots (we love both of these from Penzey's - we're fortunate to have a local Penzey's outlet here in Menlo Park!). Turn the heat down to low and cover the pan. Set a timer for 10 minutes. While you're waiting, you can toss a quick salad or sauté some fresh veggies to accompany the chops. When the timer is up, check the chops for doneness - firm to the touch - and, if done, remove them to a platter. You should still have some liquid left in the pan - if not add a touch of water. Then add 1 Tbsp lemon juice plus 2 Tbsp coarse mustard. Reduce this a bit over medium-high heat and then pour a bit over the chops. Put the rest into a small bowl or pitcher to accompany the chops to the dinner table. You'll want to add more of the sauce to the chops - and maybe the veggies - during the meal! That's it - about 25 minutes start to finish - not counting the 5 minutes it takes to rub the chops in advance. Hope you enjoy! We love our Weber - an early model of the Performa. A while back we had this fancy indirect heating gas grill - but it just didn't provide much flavor for BBQing so we gave it away and bought the Weber over 10 years ago. It's been our regular fire ever since - IMHO nothing beats a hot charcoal fire for the best flavor. On one of our morning walks last week, Chris Gulker started talking about his new Weber Performa BBQ and how he had cooked a pair of very tasty thick cut pork chops on it last weekend. Naturally, my ears perked up - pork chops are an old favorite but mostly pan fried with some sauerkraut, not BBQed. Taking Chris' excellent results to heart, we tried our own version on the Weber tonight. The result was superb - just great - and simple. I was cooking two thick cut chops - about 1.7 lbs of meat that we had picked up at a local butcher yesterday (priced at $5.99-$6.29 a pound in our neighborhood). We've got a wonderful local Penzey's Spices store here in Menlo Park that opened about six months ago. Yesterday afternoon, while the rest of the family was shopping nearby, I browsed Penzey's - with nothing particular in mind. While looking around, I picked up one of their Early Summer 2009 catalogs and noticed the rib recipe inside the back cover. While I love to eat ribs, I've never really made them - for some unknown reason! I guess my perception was that they took a long time to cook and, in particular, on a BBQ you always had to worry about overcooking them, etc. Too much hassle. For years, we've enjoyed a roast pork loin recipe titled "Roast pork loin with roasted apple compote" that was originally published in Barbara Kafka's cookbook "Roasting-A Simple Art ". Much of Kafka's book involves roasting at high heat - typically 500 degrees - and her recipe of coating the pork loin in mustard, salt and pepper at the start and then roasting with apples at that high temperature has always worked out well for us. Sometimes (depending upon how clean your oven is), roasting at that high a temperature can result in some smoking - so it takes some care. On this Christmas Day, though, we're trying some variations - something a bit different. This is truly one of those 5 minutes to prepare recipes. 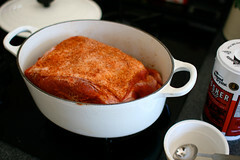 Basically, coat the pork shoulder roast, throw it in the Dutch oven and then into the real oven. Makes really great pork tortillas -- or just pork to pile onto your plate. Great with salsa on the side! We originally came across a version of this recipe in The New Cooks Tour of Sonoma by Michele Anna Jordan. It became a Loftesness family favorite from the first time we tried it! In addition to her own web site, Jordan also writes a regular food column for the Santa Rose Press Democrat. Copyright © 1999-2018 Scott Loftesness. Please Note: Because I value your opinions and feedback, I encourage you to add your comment to the discussions here on my personal blog. Don't be offended, however, if I edit your comments for clarity or decide to keep out questionable matters including deleting inappropriate or irrelevant comments.